-- First EDI, built on optical table at LLNL, tested on sunlight conducted through fiber from rooftop heliostat. Figure H3. EDI lab at LLNL March 23, 1998 showing optical table with first EDI apparatus. Shelf above it holds controllers for PZT, CCD and spectrograph. Light source is sunlight from a fiber leading from rooftop heliostat (Fig. H5). Figure H4. 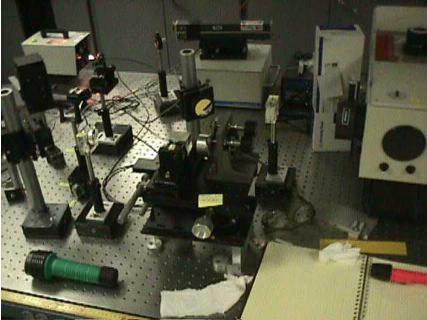 First externally dispersed interferometer, 23 March 1998, is set of optics on black labjack (with yellow postit note), imaged to the spectrograph (right) via a lens and mirror. Other pieces of equipment are useful for alignment or datataking. Figure H5. Heliostat on roof of building (directly above lab) was a Meade ETX-90 telescope mount with built-in clock drive, with the telescope replaced by a mirror that reflected light into a stationary fiber on polar axis. Aluminum foil reduced temperature. Angle of fiber in 2-axes could be adjusted from the lab via remote control to center the fiber by maximizing flux. March 1998. -- Same as March version, but optical table cleaned up for publicity photo in preparation for presenting results to LLNL funding committee. Figure H6. Closeup of interferometer on 6/2/98. 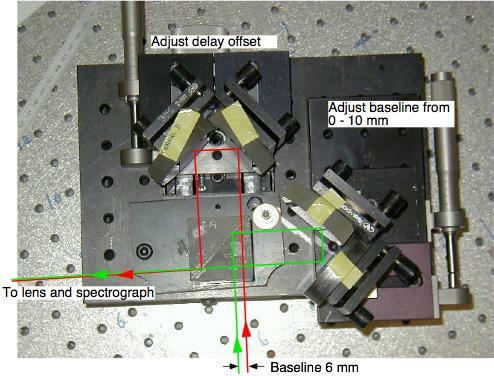 One mirror was mounted on PZT translater so that interferometer delay could be adjusted by small amounts, to do phase stepped data taking, and (later) to stabilize the delay to thermal drifts. Glass etalon, in concert with a displacement of the other mirror, creates an angle independent delay between the two interferometer arms of about 11 mm. Figure H7. Photo of the first EDI apparatus taken June 2, 1998 in preparation for presenting the project's results to the LLNL funding committee. -- A 2nd EDI was built using a high diffraction efficiency volume holographic grating. Photo of EDI built by Erskine July 1999 using a volume holographic grating spectrograph from HoloSpec Inc., which advertised 80% throughput, Res = 5000 over a 900 Å bandwidth in the green. 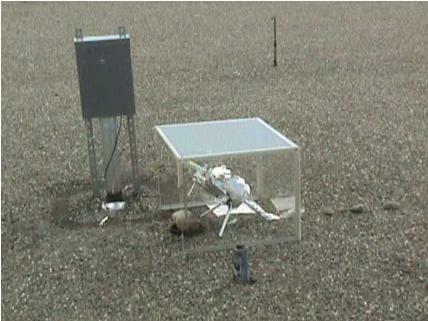 In this apparatus a piggyback HeNe laser cavity stabilization was tested. The small black TV CCD observed red HeNe fringes reflected from a mirror mounted on a small brass piece very close to the beamsplitter cube. 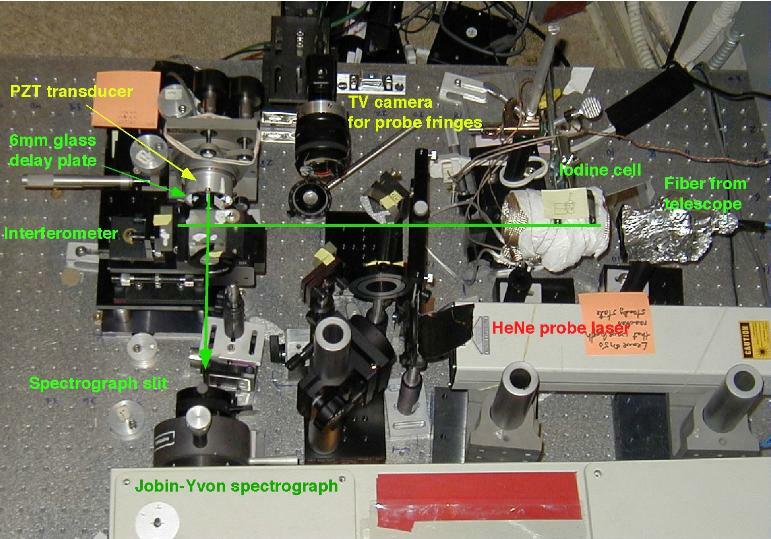 Although this spectrograph had very much higher diffraction efficiency than the Jobin-Yvon spectrograph of the other EDI, the smoothly adjustable slit width and adjustable center wavelength of the Jobin-Yvon made it more convenient for proof of principle experiments. So the Jobin-Yvon version was chosen to bring to Lick in Dec 1999 for starlight testing. -- First fringing spectra on starlight were obtained at the 1 meter Nickel telescope at Lick Observatory December 1999. The June 1998 EDI was modified by adding cylindrical optics and a piggyback HeNe laser cavity stabilizer, and a fiberoptic interface was mounted to the Cassegrain focus of the telescope. The stars observed (such as Arturus) were not planet bearing, but Doppler velocity data was successfully obtained from the processed spectra with ~7 m/s precision. Plans were to return to observe a planet bearing star, but project funds ended too soon. More photos at link; Report at Ref. 3. The first observatory EDI being assembled on a 4 ft. table next to the 1-meter telescope at Lick Observatory Dec 1999. A fiber conducts starlight from the telescope to the interferometer on the table, which also holds the Jobin-Yvon spectrograph having ~5000 resolution. 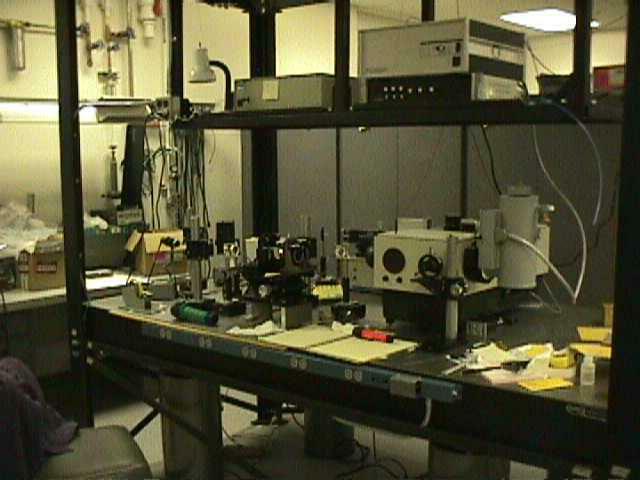 Closeup of the first observatory externally dispersed interferometer, on a 4x4 foot table next to the Nickel 1-meter telescope at Lick Observatory in December 1999. Starlight from an optical fiber from the Cassegrain focus of the telescope passes through an iodine cell, and then through the fixed-delay interferometer (11 mm roundtrip delay) before entering the Jobin-Yvon spectrograph (having ~5000 resolution for a 340 Å band in the green). A piggyback HeNe laser that passes through the same interferometer cavity, but at a more acute angle as the starlight, provides a means of stabilizing the cavity length against thermal drifts of greater than quarter wave. This is connected via a TV camera and computer to a feedback loop that controls a mirror position (mounted on a PZT transducer). 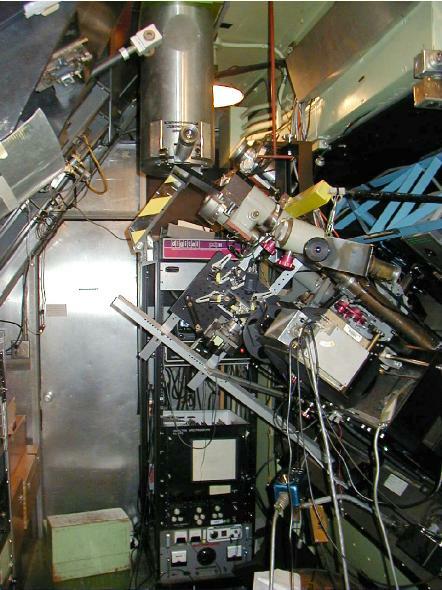 Externally dispersed interferometer that demonstrated spectral astrometry concept in the lab. This is a method for measuring angular differences between two or more stars differentially. 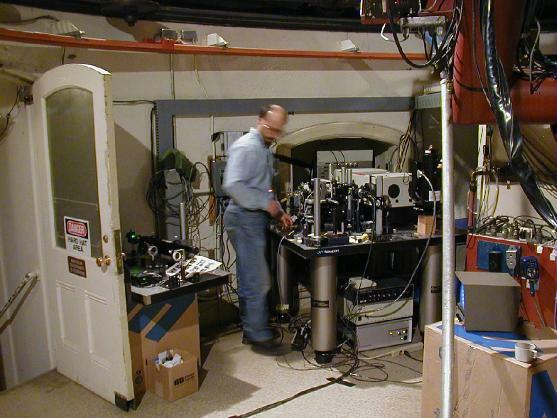 This lab interferometer has a "long" baseline of a few millimeters. The "stars" are pinholes back-illuminated by white light and placed across the room. When light passes through this interferometer and then into the spectrograph, each "star" creates a comb spectrum with a periodicity (fringes per unit of dispersion) proportional to the angle of the star relative to the interferometer baseline. Two stars then creates beats, and the number of beats across the bandwidth is proportional to the angular difference, independent in the angle of the apparatus (or the variable delay offset). Hence the angle of the apparatus and other drifts in its baseline do not need to be stabilize to the high degree that is necessary in the conventional single-star astrometry technique. Link to data; Report at Ref. 6. -- An EDI was placed in front of the slit of the Lick Observatory echelle spectrograph to demonstrate that fringes could be imprinted on the multi-order spectral format of an echelle, and that the moire patterns could be extracted even though the beam height is too small to allow the phase to vary along the slit as in our usual fashion. A 2x resolution boost on the stellar spectrum was demonstrated, from 50,000 to 100,000. Link to data; Report at Ref. 7. The EDI apparatus prior to mounting in front of the echelle spectrograph slit. 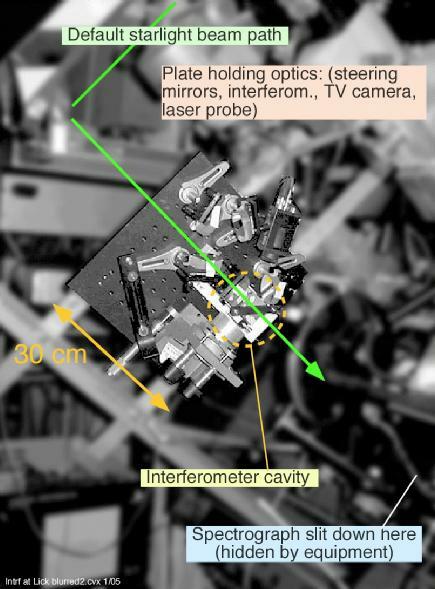 The interferometer was mounted on a 30 cm square breadboard along with a TV camera for monitoring probe laser fringes (to stabilize cavity length) and the fiber carrying the laser light. Three additional mirrors upstream of the interferometer were added so that the total number of reflections of the beam was an even number, so that translation of the breadboard did not deviate the starlight beam. The focal point of the starlight beam had to be changed by a few centimeters to accomodate the longer travel. multiple delay scheme could be used. 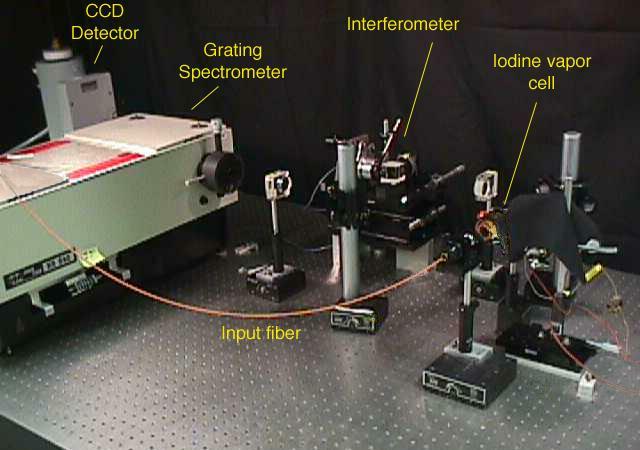 Photograph of an EDI using a small Michelson interferometer, in series with a commercial linear grating spectrograph of R~25,000 resolution. 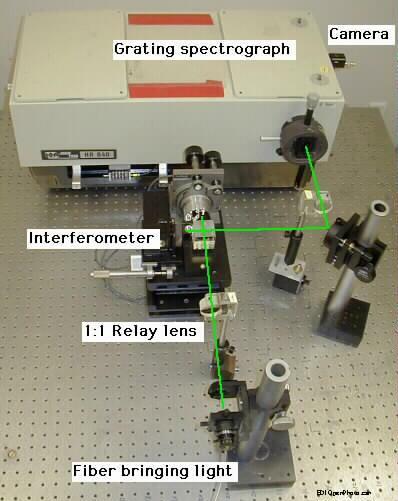 A relay lens images light from end of fiber to mirror plane of interferometer, where fringes are imposed. 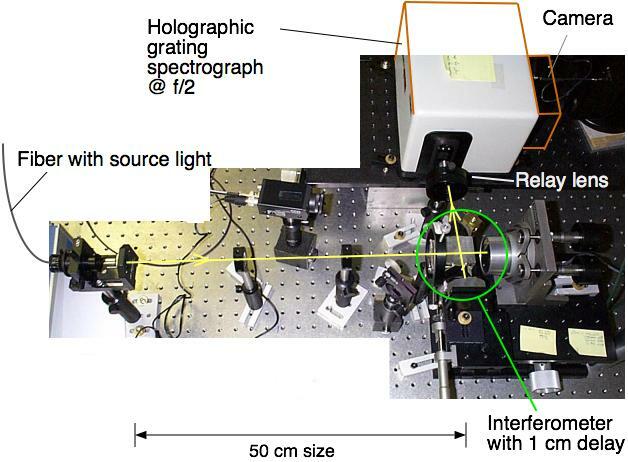 Another lens images mirror plane to slit of spectrograph. When taking data a scientific quality CCD would be used instead of the small TV-quality camera shown. Closeup of an EDI. 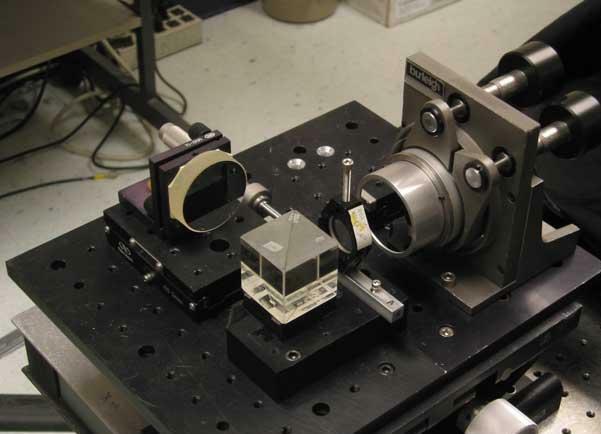 Here a 1/4-inch glass etalon is between the 40mm beamsplitting cube and one of the mirrors, to produce a 1 cm delay path length difference between the two arms that is angle independent. This allows high visibility fringes from extended sources such as wide diameter optical fibers or blurry star images. For the 6x resolution boosting demonstration multiple exposures were taken with different delay values by swapping out different thickness glass etalons up to 1 inch thick (and re-adjusting the mirror position to accomodate).